Director – Colin Trevorrow, Screenplay – Derek Connolly, Rick Jaffa, Amanda Silver & Colin Trevorrow, Story – Rick Jaffa & Amanda Silver, Producers – Patrick Crowley & Frank Marshall, Photography (3D) – John Schwartzman, Music – Michael Giacchino, Visual Effects Supervisor – Tim Alexander, Visual Effects – Industrial Light and Magic, Special Effects Supervisor – Mike Meinardus, Production Design – Ed Verreaux. Production Company – Universal/Amblin Entertainment/Legendary Pictures. Brothers Zack and Gray Marshall are sent to Jurassic World, the now fully working version of the dinosaur park on Isla Nubar, where their aunt Claire Dearing is the Chief Operational Officer. Claire is involved in plans to launch a more ferocious genetically-redesigned dinosaur they call Indominus Rex. 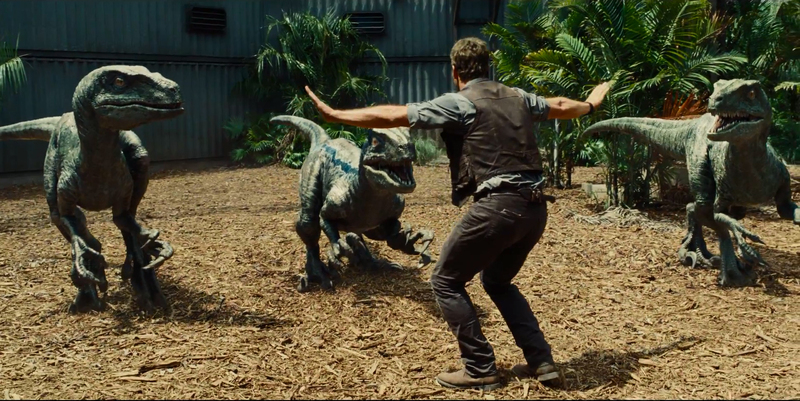 Owen Grady, who has successfully managed to train a pack of velociraptors to heed his commands, is brought in to assess the safety of the Indominus’s pen. He warns that creating a genetic hybrid like this is a mistake. While he is there, the Indominus manages to break free from its pen and rampages across the island, killing everything, human and dinosaur, in its path. Claire orders the evacuation of the park before the Indominus reaches the areas where all the tourists are gathered. However, she is overridden by security head Vic Hoskins, who is hell-bent on the idea of sending the trained velociraptors to stop the Indominus. Meanwhile, unaware of the danger, Zack and Gray have gone off the grid to explore the park and are forced to proceed on foot after their vehicle is damaged. At the preview screening for Jurassic World, I found myself rather amazed to discover that many of the other press people and attendees were only familiar with the Jurassic Park series through tv re-runs or video/dvd – in some cases, had not even been born when the original Jurassic Park (1993) came out. It says a number of things. First, something about the durability of a franchise that can still draw audiences in after twenty years and deliver a box-office smash despite not having released an entry for fourteen years. On the other hand, it perhaps says something about how modern Hollywood keeps recycling the same ideas. It also makes me feel old in having lain claim to seeing all three previous Jurassic Park films during their original theatrical runs. This younger audience also tends to have no memory of just how groundbreaking Jurassic Park was when it came out. It was the dawn of the CGI revolution. The trailer did an amazing job of building up awe and wonderment before the film finally provided dinosaurs. The results wowed audiences enough to make Jurassic Park the No 1 box-office hit of its year. This was followed by two disappointing sequels, the weak The Lost World: Jurassic Park (1997) and the marginally better Jurassic Park III (2001). Both seemed to be just recycling the formula of the first film – people stranded on an island and hunted by dinosaurs. A Jurassic Park 4 has been talked about ever since before Jurassic Park III hit theatres. There had been numerous variations on the film in the planning phrase – at one point, acclaimed indie director John Sayles even turned in a script that involved dinosaur-human hybrid soldiers. All of the original principal cast have been attached and then not attached to the project at various points. The final version of the film comes from Colin Trevorrow, a relative newcomer of a director who first made a splash a couple of years earlier with the quirky Safety Not Guaranteed (2012) – this is only his second film. Trevorrow co-writes the script with Rick Jaffa and Amanda Silver who did impressive things in revitalising the Planet of the Apes series with Rise of the Planet of the Apes (2011) and Dawn of the Planet of the Apes (2014). I must admit to not having very high expectations of Jurassic World before going in. The trailer had received some fairly negative reception around the blogosphere following its premiere. More to the point, I felt that the two preceding sequels had failed to provide much in the way of original ideas and were just rehashing the same plot – I expected this was due to the limitedness of the premise and that Jurassic World would be no different. That said, I ended up being pleasantly surprised. Jurassic World comes as a sequel that quickly injects a host of fresh new ideas into the mix, far more than both the previous sequels put together. In fact, one would go out on a limb and say that this actually has more interesting ideas to it than The Lost World (1995), Michael Crichton’s book sequel to his original novel. Unlike all the other sequels, it also opens up the range of dinosaurs on show rather than simply staying with the tried and true menace. Moreover, it wows, excites and thrills in all the right places. Although the complaint might be that Colin Trevorrow, while doing a perfectly worthy job in his own right, never gives us anything as seat-edge as the sequences that Steven Spielberg delivered in the original. The premise of Jurassic World builds on the idea of the park we saw in the beta-testing stage in Jurassic Park and now shows it as a fully operational entity. This comes with some fascinating scenes as we see how the dinosaurs have been commercialised into family-friendly exhibits – the park is akin to a Disneyland with monorails running through the paddocks or mocked up see-through tree trunk tunnels where people can roam amidst the animals. 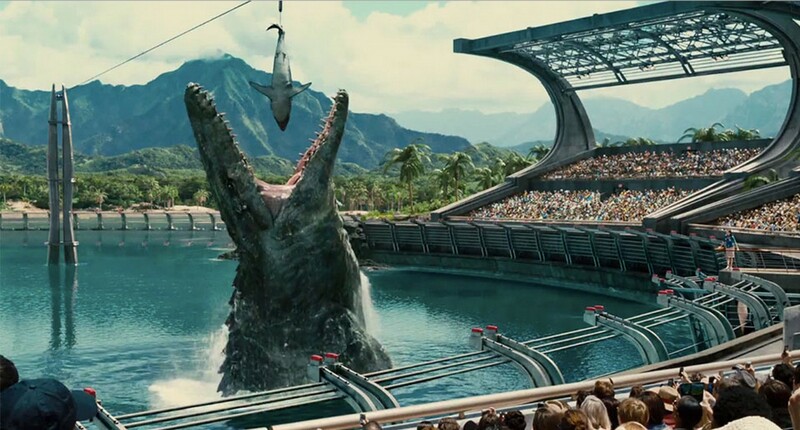 There is even a Sea World where audiences are seated in a massive stadium-styled arena watching aquatic dinosaurs devouring sharks and seats that then descend beneath the water level so that people can see the submerged dinosaurs. There all manner of fascinating little touches – the equivalent of petting zoos where children can even ride stubby baby stegosaurs; interactive computer displays and holo exhibits just like a modern museum; a concourse filled with brand name franchises; even the bored minimum-wage attendants guiding people onto rides and panicked at having to deal with an emergency. A lot of creative thought has gone into this. This is the first Jurassic Park follow-up that actually feels like a sequel in terms of doing something that expands and build on where its predecessor went. Perhaps the most intriguing set of ideas that Jurassic World plays around with are those concerning the corporatisation of the park. 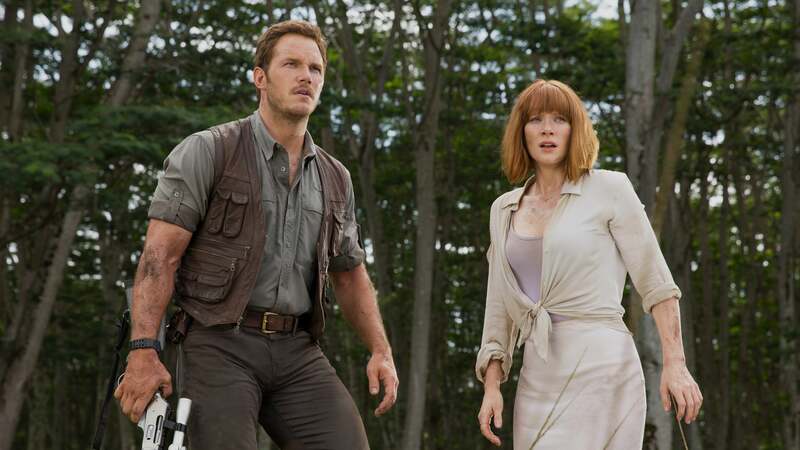 The film has a dialectic running through it where Bryce Dallas Howard’s COO is seen as obsessed with shareholder profit points and attendance numbers, treats the dinosaurs as ‘assets’ and speaks of the need of having to innovate and market new dinosaur designs based on test group surveys. The point-of-view character is made to be Chris Pratt who is identified with someone who understands the dinosaurs’ behaviour and, not unlike Jeff Goldblum in the original, gives stringent warnings about the dangers of meddling, which of course proceed to come true. The message of unforeseen dangers of science that we had in the original has now become one cautioning about corporate greed and a marketplace that is ruthlessly obsessed with coming up with constant cool new designs to wow an audience. Which would all be a fine and potently made message but for the fact that Jurassic World is also one of the most heavily marketed films of the year. Does this make it a film that operates with a vast blindspot that thinks it is making a big point unaware that the people in the studio boardroom regard the film as an asset and are obsessed with shareholder profits and exploiting an audience’s need for wow just as much as Bryce Dallas Howard’s character? Or is it perhaps that the writers have inserted a huge subversive message despite the film’s corporate sell? Is this even a thinly veiled allegory for the way the film went through its development process? When Chris Pratt jokes about the newest dinosaur design being branded by Verizon Wireless, it is hard to tell whether it is the film making a snide joke about product placement or if it really is a joke that the filmmakers managed to turn into just another cynical opportunity to slide in said product placement. Chris Pratt does a well worthwhile job in a part that was almost certainly the one Harrison Ford was touted to play a few iterations of the script ago. Pratt has some well written lines and delivers them with both intent seriousness and rugged handsomeness. The others characters stand out less so. The kids are there mainly because all the other films threw kids in as audience identification figures for the young ones. Vincent D’Onofrio is cast as the standard heavy who only sees military application in the discovery – the disappointment is in seeing an actor of D’Onofrio’s calibre in what is no more than a stock cut-out role. The one who fares the least well is Bryce Dallas Howard, an extremely talented actress, who is stuck with the datedly sexist role of the woman who has risen to the top of the boardroom and missed out on motherhood and relationships, indeed seems comically clueless when it comes to dealing with personal matters. At least, the latter half of the film has her stripping down to singlet and wielding a gun as though to compensate but does not excuse the poor character writing. This was followed by Jurassic World: Fallen Kingdom (2018). Colin Trevorrow next went on to make the non-genre indie film The Book of Henry (2017) and co-writes the script for Jurassic World: Fallen Kingdom. (Nominee for Best Special Effects at this site’s Best of 2015 Awards).